Addressing the most common workplace relationship challenges, this manual shows how to use the principles of Nonviolent Communication to improve the workplace atmosphere. Offering practical tools that match recognizable work scenarios, this guide can help all employees positively affect their work relationships and company culture, regardless of their position. 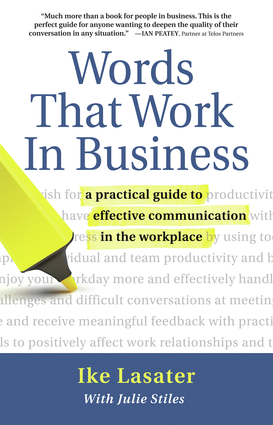 This handbook displays proven communication skills for effectively handling difficult conversations, reducing workplace conflict and stress, improving individual and team productivity, having more effective meetings, and giving and receiving meaningful feedback, thereby creating a more enjoyable work environment. Ike Lasater is a cofounder of Words That Work, a consulting and training firm that helps organizations achieve results through better communication and collaboration, and a cofounder of Yoga Journal magazine. He is a former board member for the Center for Nonviolent Communication and for the Association for Dispute Resolution of Northern California. He lives in San Francisco. Julie Stiles completed a Master's degree in Consciousness Studies at John F. Kennedy University. She has a background in education and technology, and currently works as a writer helping professionals articulate and shape their ideas for publication. She also has completed a manuscript on the process of transformation of consciousness. Julie has studied Nonviolent Communication through JFKU as well as with Marshall Rosenberg, Ike Lasater, and John Kinyon.